Want to increase your take home salary or maximize your tax saving? Use this Form 12BB generator to declare investments, interest paid against Home Loan, House Rent Allowance, Leave Travel Allowance and other tax saving deductions. The Form 12BB is the form that you fill and give to your employer - not to the Income Tax Department - so that your employer can figure how much income tax is to be deducted from your monthly pay. Basically , it contain the details related to tax deductible expenses and investments which would be done by you during the current F.Y. Generally you fill out a form 12BB when you start a new job or in the beginning of the financial year. However, at the year end you are supposed to submit the actual proofs/evidences against the tax exemptions ,investments and expenses already claimed by you in the form 12BB. Previously there was no standard format for declaring your tax deductible expenses and investments. With effect from 1st June 2016, Income tax department has introduced a standard format of Form 12BB. What is the purpose of Form 12BB? The Income Tax law gives powers to your employer to give you benefit of all the tax deductible expenses and investments made by you during the year at the time of deducting your income tax from your monthly paycheck. However, just one condition is there , this benefit is provided to only those employees who submit their declaration / proofs of income tax deductions in Form 12BB are eligible for this benefit.Thus,Employees must complete this form so that their employers can know how much income tax needs to be deducted from their monthly paycheck and, in turn, how much money they will take home with each paycheck. Now, that we have understood the importance of Form 12BB, let’s understand Form 12BB a bit in detail. What is the format of Form 12BB? The Income Tax Department has made a standard format of Form 12BB. It has to be prepared as per Rule 26C of the Income Tax Rules.You can download the form 12BB online in pdf or word format, print, fill and submit to your employer alongwith the required proofs. Alternatively, you can fill Form 12BB online and either mail to your HR directly or print, sign and submit to your employer alongwith necessary proofs. Download fillable Form 12BB of Income Tax for 2017-18 Now! What information are required to be filled in Form 12BB? What are the things to be done before filling Form 12BB? Study your CTC structure carefully to know, whether HRA or LTA are a part of your package.You can claim these allowances only when your employer explicitly makes them a part of your CTC structure. Go to your bank or download online your interest certificate and loan repayment schedule of your home loan and your bank account statement. Assemble all your receipts for all the income tax deductible expenses and investments done by you like Rent receipts, LIC premium receipt, tuition fees receipts, donation receipts etc. Filling tax forms can be a nightmare for many of us. However, filing Form 12BB isn’t as scary as it might look. So,let’s just get down with it! PAN No of your landlord in case the total amount of rent paid during the year exceeds Rs.1 lakh. In Addition, you also need to submit the proof for claiming HRA tax exemption . The proof for claiming HRA tax exemption are the monthly rent receipts. In many organisations, employer also ask for the rent agreement for allowing HRA tax exemption. This is the best tax saving avenue.Calculate your HRA tax exemption with our free HRA exemption calculator tool. You can claim HRA tax exemption only when HRA is a part of your CTC. Incase, HRA is not a part of your CTC and you are living in a rented house you can claim tax benefit under section 80GG. Rent receipt is required only when your monthly rent exceeds Rs. 3,000. You can’t claim HRA if you are living in your own house. If you are paying rent to your parents, then ask them to show it as their income at the time of filing their Income Tax Return. Never submit fake rent receipts, this might land you in big trouble with the income tax authorities. Even if your employer do not ask for rent agreement, it is advisable to have a formal rent agreement printed on Rs. 500 stamp paper or as per the rate prevailing in your state for records. This allowance is one and the only allowance that helps saves tax only when you take a holiday. To claim LTA, employees need to submit travel bills like boarding passes, flight tickets, invoice of travel agent, boarding pass etc. to employer. You can claim LTA only when it is a part of your CTC. You can claim LTA for yourself, your spouse, children,dependent parents and dependent brother and sister. It can be claimed twice in a block of four years. The current block is 2014-2017. If you have claimed only 1 LTA in the previous block of 4 years, you can carry forward and utilise the 2nd LTA but have to claim it in the first year itself of the next block. It is allowed for domestic travels and not for international travels. Deduction of interest on borrowings on home loan is allowed under section 24 of the income tax laws. You can claim deduction for interest on your home loan taken for construction,reconstruction, repair, purchase or renovation. 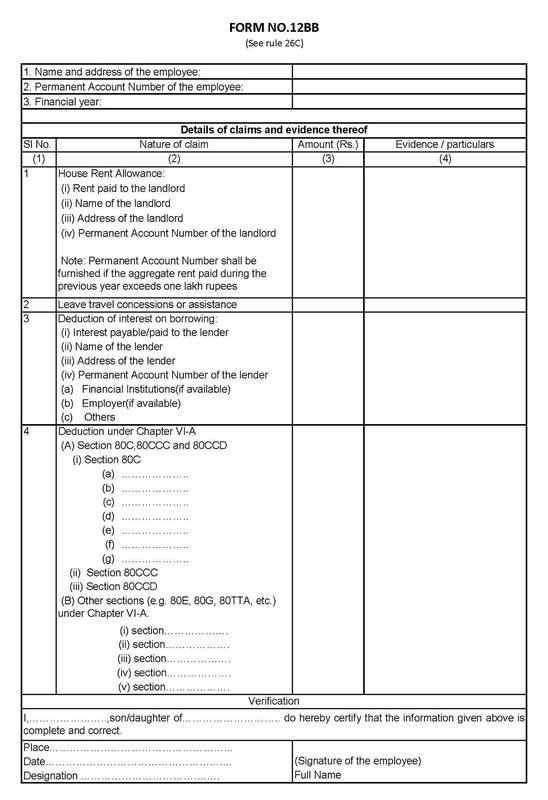 Statement / Certificate stating total EMI paid along with Interest and Principal components. Self-declaration from employee whether house is self occupied or let out. If you are paying interest on home loan, then quantum of deduction will depend on the type of house property. Let’s discuss the same in detail. Tip : Claiming deduction on interest payment shall result in a loss under head house property. This loss can be adjusted against income from other heads in the current year subject to the limit of Rs. 2 lakh. Maximum interest of Rs. 2, 00, 000 is allowable in case loan is taken for purchase or construction of your house. Such benefit shall reduced to Rs. 30, 000 in case loan is taken for repair/ reconstruction. Further, construction or purchase must be completed within 5 years from end of F.Y. in which loan is taken. Note : However, from 1 April 2017 onwards i.e. F.Y. 2017-18, the maximum tax exemption of Rs.200,000/- can be taken for all type of houses(let-out/self-occupied). Incase, you have paid more than Rs.2,00,000 as interest on home loan taken for construction/purchase, then the remaining amount shall be allowed to be carried forward for set-off in subsequent years. Incase, you have taken a home loan jointly then you can claim benefit of the interest deduction proportionately. If you have taken home loan from a lender other than bank i.e. your friends, relatives or any money lender the interest payment can be claimed as a deduction under section 24.Provided you take a certificate of interest from the person to whom you had paid interest. Where loan is taken from your friends, relatives or any money lender i.e. other than banks the repayment of principal is not eligible for deduction under section 80C. This part of the form may take more time to finish if you are claiming maximum tax benefits .If you do not have any deductions to make, you can then move on to last section. 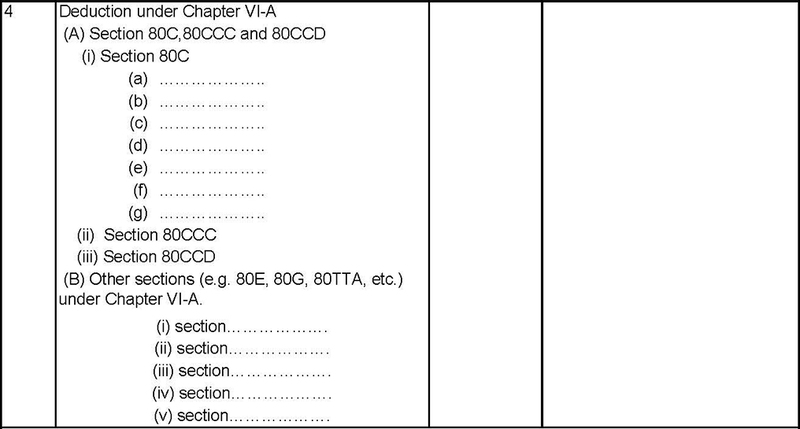 Chapter VI-A covers income tax deduction under various sections like 80C, 80D (Medical insurance) 80G (Donation) etc. To claim deduction, evidence of investment made or expenditure incurred is required. You might be wondering what kind of proofs are required to submitted to claim these deductions. Don’t Worry, we are here to help you. The last section of the Form 12BB is the “verification” of the information submitted in the Form 12BB. You need to just enter your name along with the name of your father/mother and the place(city in which you are filling the form) and date of filing the form and then sign the form. How to Fill out Form 12BB when you changed the jobs? If you have changed the jobs during a particular year then do not claim the maximum benefit of all the deductions with both the employers, otherwise your TDS deduction will not be correct and ultimately at the time of filing your Income Tax Return you will have to end up with paying tax to the Income Tax Department with applicable penal interest for late payment of taxes. What happens if you accidentally forget to give your employer your Form 12BB? In case you forgot to submit form 12BB to your employer within the prescribed time, the employer will not be able to give you benefit of deductions and other tax exemptions. As a result, excess TDS will be deducted from your monthly salary.However, you can claim refund of such excess TDS while filing your income tax return. How to claim for perquisites that are not covered in the Form 12BB ? Perquisites are claimed in Form 12BA and not Form 12BB. Form 12BA is a statement showing particulars of perquisites, other fringe benefits or amenities and profits in lieu of salary with value thereof. How will I show the additional investments which an individual misses to declare in the Form 12BB? The additional investments which an individual had missed and not declared in Form 12BB can be claimed while filing return. Although, excess TDS will be deducted from his salary during the year, however he can claim refund of the same in his ITR. I made declaration in January for making investments in March, But did not submit to my employer. What are the consequences of declaring investments but not submitting the proofs? If you have not submitted proof of some investments which you have declared in Form 12BB then those would not be considered by your employer. Resultantly , TDS would be calculated ignoring those proofless investments. Tax season can be a confusing and overwhelming time. With the number of different tax forms and sections out there, it’s difficult to keep track of them all. One way to ensure a stress-free tax season is by correctly filling out your form 12BB when you start a new job or in the beginning of the year. In addition, it’s a good idea to start your tax preparation early and stay on top of the process. If you’re unsure whether you need to file your taxes, there’s an income threshold that helps determine whether you should file or not . This threshold is determined by factors like age, earned income, residential status. If you’re struggling with income tax sections and provisions, not to worry. There are a lot of calculators out there to make the process clearer. You can use our income tax calculator to estimate taxes you owe . And keep in the mind that there are tax changes every year, so this year’s tax season may be different than last year’s. If this is hard to keep track, you can always seek a CA for help. If you don't have enough TDS deducted, you will owe Income Tax Department at the time of income tax return filing. If you have excessive deduction, you will get an income tax refund. The key is to find the right balance. Failing to turn in a Form 12BB is a big no-no. But you could run into other issues if you don’t include the right numbers on the form. If you don’t pay enough, you might owe additional taxes later on. If you make the mistake of paying taxes too much, you’ll get that money back in the form of a tax refund once you’ve filed and verified your income tax return.